Some of the Valaida S. Walker Food Court’s most healthy-looking choices may carry some hefty calories. 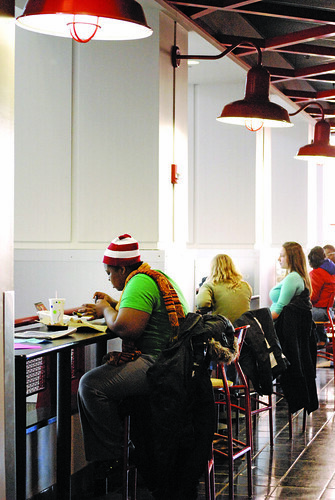 Students eat lunch in one of the dining areas outside the Student Center food court. The salad options through Einstein Bros. or the salad bar may not be as healthy as you think (Anna Zhilkova/TTN). A salad is generally a healthier meal to eat, but what about an 820-calorie salad? No, it is not from McDonald’s or Wendy’s. This 820-calorie salad, called the Bros. Bistro salad, comes pre-packaged from the Einstein Bros. Bagels. Unfortunately, unlike the Johnson & Hardwick cafeteria, there are no signs at Einstein Bros. Bagels to inform customers about the nutritional information on any of its products. None of the pre-packaged food in the Valaida S.Walker Food Court is labeled either. To obtain this information, students can ask Dining Services personnel or visit einsteinbros.com. “We are not liable by the company to post this information, so we choose not to,” said Dan Callen, manager of Einstein Bros. Bagels in the Student Center. Also high in calories are the chicken caesar and chicken chipotle salads, which are in the grab-and-go refrigerator. The chicken caesar salad chicken has 820 calories, while the chicken chipotle has 710. Choose any one of these three salads, and the average calorie count is about 780. The Bros. Bistro salad weighs 10.5 ounces and costs $4.98. The chicken caesar salad weighs 14 ounces and costs $5.89, and chicken chipotle is 15.2 ounces for $5.89. In the food court, there are two seemingly healthy options: the Einstein Bros. Bagels grab-and-go salads and the Sizzling Salads bar, where diners can create their own salads. The charge to create salads is 42 cents per ounce. For the same price of a pre-packaged salad, diners can make about a 14-ounce salad. Freshman kinesiology major Sarah Plaviak chooses to eat the chipotle chicken salad despite the 710-calorie amount. “If you get a salad from the salad bar, it costs too much,” Plaviak said. If Einstein Bros. Bagels’ salad can contain as many as 820 calories, how many calories are in the salads of fast food restaurants? McDonald’s and Wendy’s are just two top fast food chains nationwide that now have salads on their menus. McDonald’s Premium Southwest salad with crispy chicken is the highest calorie salad on its menu. It weighs 12.5 ounces and has 430 calories. Wendy’s mandarin grilled chicken salad weighs 14.2 ounces, has 540 calories and is the highest calorie salad on the fast food restaurant’s menu. Feasting on one of these two salads and ordering a small fry and would still have a lower calorie count than Einstein Bros. Bagels’ bistro salad or the chicken caesar salad. For those who reluctantly choose to get a salad instead of giving into a sweet tooth, Ben & Jerry’s and Edy’s ice cream are available. Instead of high-calorie salads, choose to down a whole pint of Ben & Jerry’s “Lighten Up!” chocolate chip cookie dough ice cream, which contains a total of 800 calories. There would be 20 calories to spare. If the idea of cookie dough isn’t appealing, have a whole pint of Edy’s MAXX Java Chocolate Mash Up ice cream, and there still would be 20 calories left over. With the ice cream pints, nutritional facts are provided. Wandering around the Student Center debating what to eat? It is a tricky choice between convenience and cost — and the choice between salad and ice cream. Samantha Kelly can be reached at samantha.kelly0002@temple.edu. Learn how to beat the recession in just 766 pages.